Sebastian Copien kindly let us watch over his shoulder as he worked in his kitchen in Munich, thereby giving us an interesting and revealing first-hand insight into the vegan lifestyle he’s leading. He showed us around his kitchen and garden, talking us through each individual area, and thrilled us with some delicious, feel good vegan food, grown and made in Bavaria itself. During the interview, Copien reveals that he’s loved being in the kitchen ever since he was a small child. 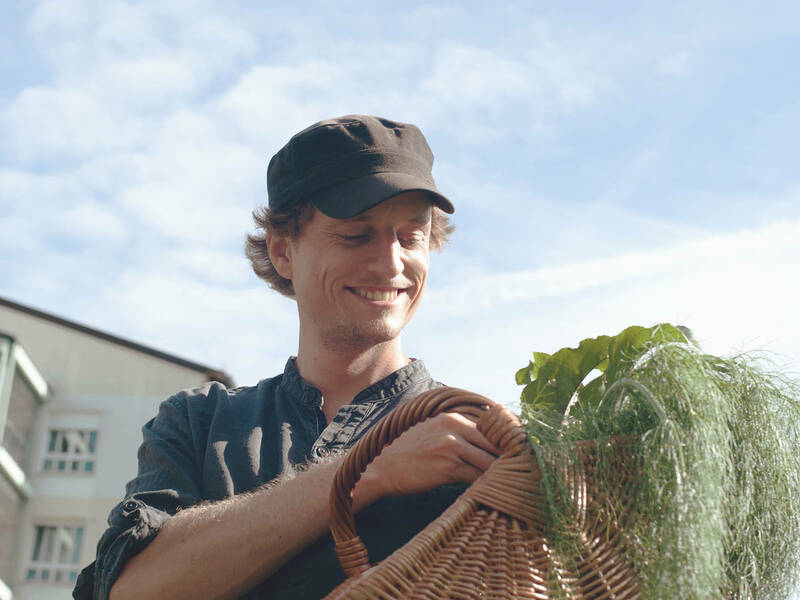 He’s come a long way since then; the Bavarian cook started his own business almost 10 years ago and is now a successful cookbook author, cooking teacher and hobby gardener in Munich. For his cooking shows, recipe development, and dinner events, he has traveled all over Europe. As well as giving advice at hotels and restaurants, he also leads seminars and provides courses in various vegan cuisines at his cooking school. During his "From Farm To Table" Events, Sebastian creates finest vegan artwork on plates. Many of his ingredients come directly from his garden. His school is in the perfect location for him and his ingredient choices, as it’s only 5 minutes away from the garden where he grows all the plants and vegetables he needs to cook with. Vegan cooking is fascinating and never gets boring for him, as he has to tackle the difficult technical challenges of preparing recipes in unconventional ways in order to suit his vegan needs. His diet and cooking philosophies also heavily rely on whatever ingredients are in season, and on what produce is readily available in the surrounding region. He then incorporates these fresh and local ingredients into dishes that are fun to make, look good and, most importantly, taste delicious. The origins of the food we eat are extremely important to Sebastian Copien. During his cooking courses, Copien explains his food’s journey in minute detail: from the garden, to the kitchen, and ultimately to the dinner plate. His focus on veganism is also mirrored in his belief that people’s bodies and minds can sense what foods they need and should be eating. According to Copien, cooking is thereby a way of staying true to yourself by simply giving your body what it needs and wants. To help people cook independently and still eat a healthy and balanced diet at home, Copien has released four vegan cookbooks. We were lucky enough to see him cook some of his favorite, delicious, seasonal recipes from his books “Die vegane Kochschule” and “Fit Mix: Vegane Blitzrezepte aus dem Mixer”. We’ve even recorded it on film so we can show you.